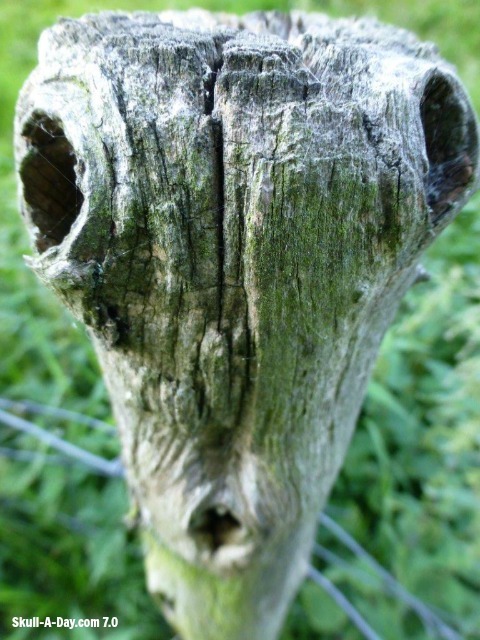 Today's skull was found by Michael Pounder, of Middlesbrough, in the UK. This skull was reflected onto bottle of cola, in his fridge. It seems to be the reflection of items on the top self, being cast down. 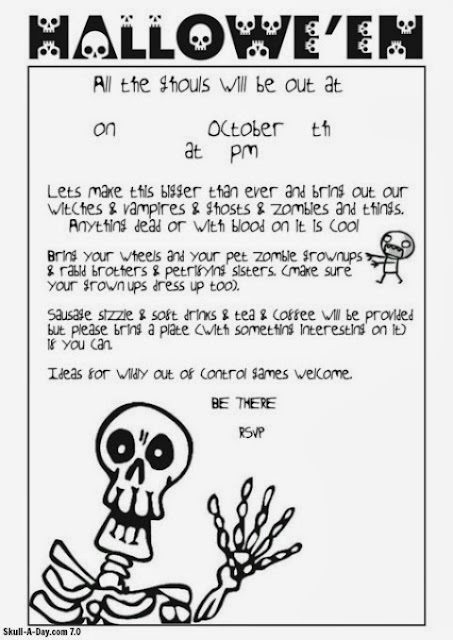 St Mary created these Halloween party invites using the Skullphabet #1 and Quoth the Skull. 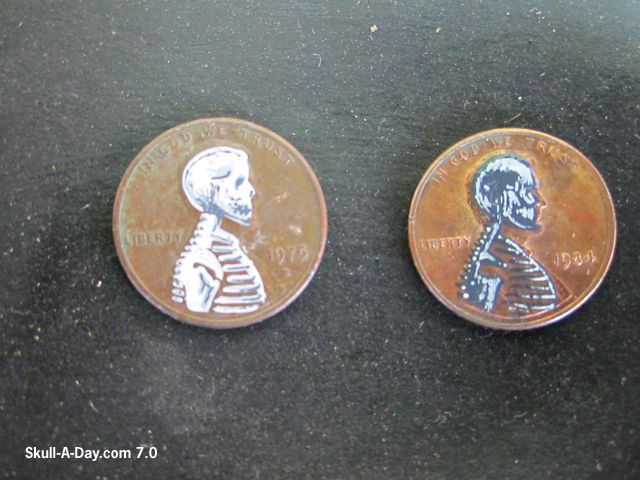 We love seeing what people create with the Free Stuff available on our blog. 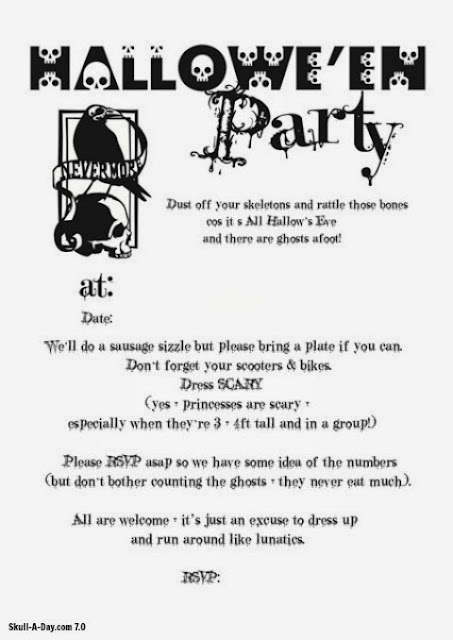 This party looks like it will be a lot of fun. Might I suggest a zombie race or "brain" eating competition as games? We love Halloween around here. 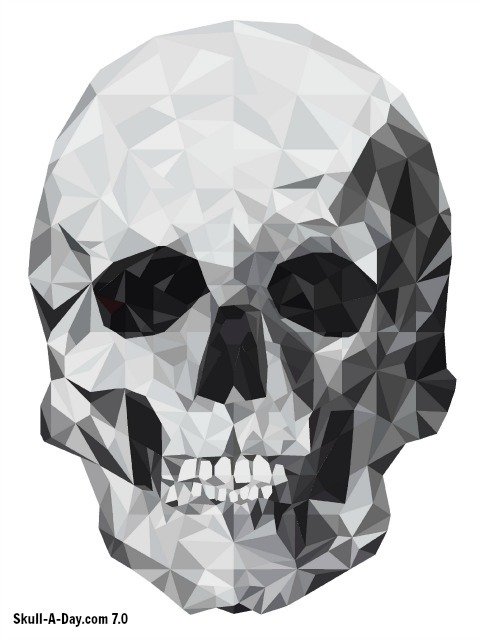 If you make something awesome and skull related this Halloween (or have something from past ones) please submit it to us! 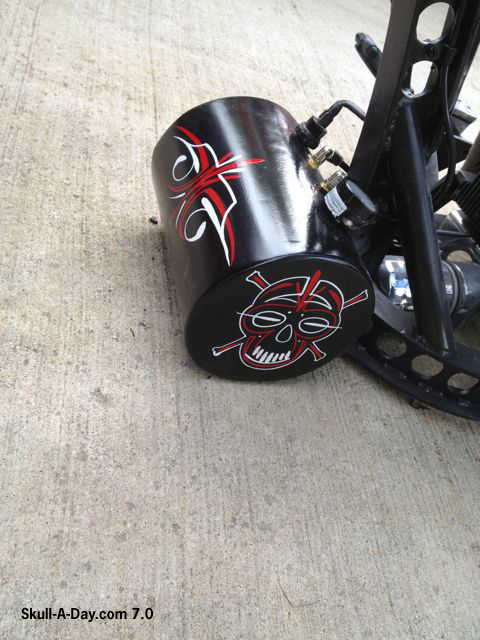 We'd love to share your skully creations! Don't forget you have until 11:59pm Eastern USA Time Friday, September 27, 2013, to enter the the current giveaway. 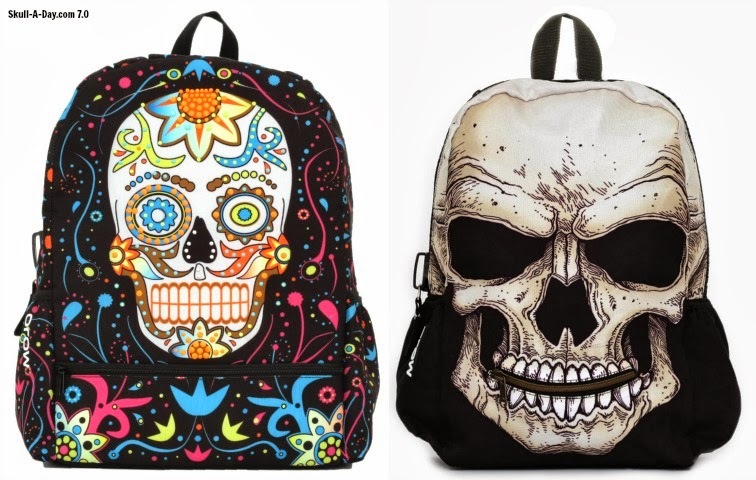 Mojo Backpacks is giving away these two skull backpacks...one per winner. You can find the original contest post by clicking the side bar ad, or this link. Herbert Hoover keeps it simple and abstract with this drizzled(?) 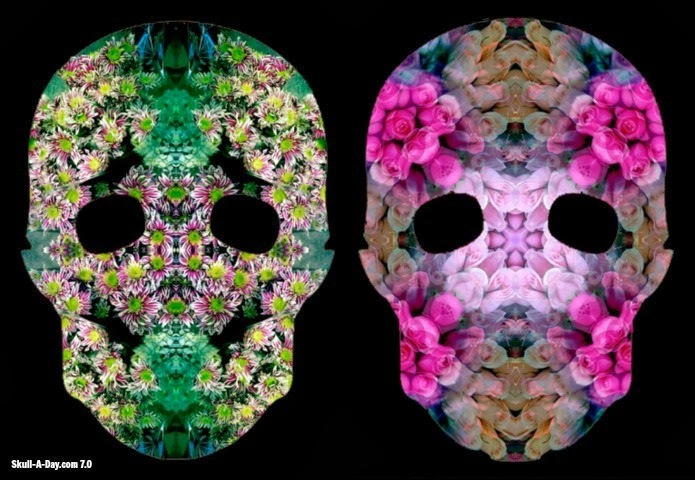 paint skull. I'm assuming the canvas is a patch of concrete, which makes a great background against the stark white paint. 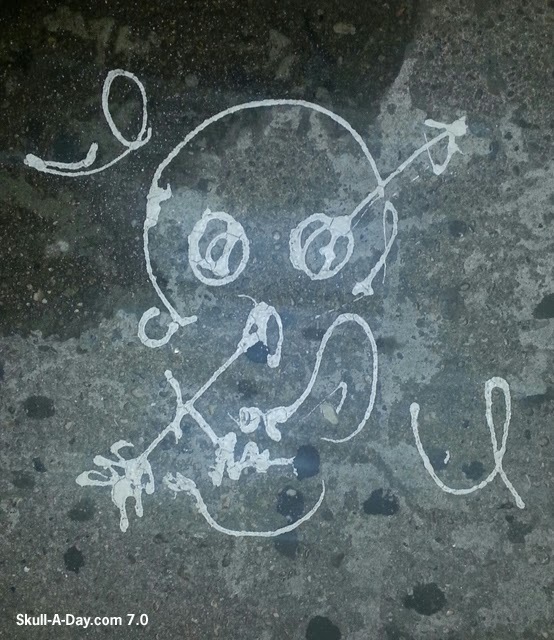 This kind of reminds me of another "Drizzled Skull" that appeared on our site back in the day. Thanks again for sharing your stuff, Herbert! 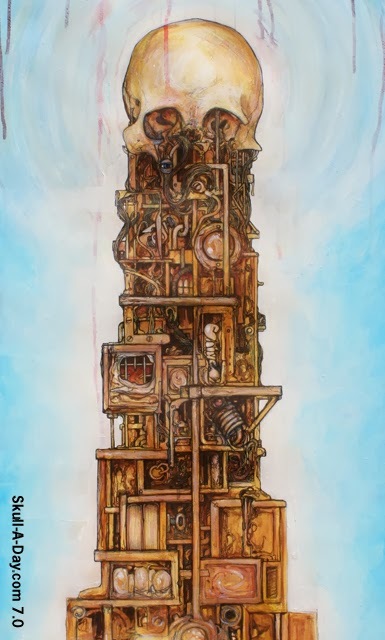 Wayne Chisnall is rising to new heights with what he refers to as, "well it was supposed to be a drawing, but it rebelled and decided to become a painting that I made as a preparatory sketch for a tower sculpture that I'm planning." A foreboding and ominous structure indeed, harboring untold horrors within, "THE TOWER"! MUAHAHAHA! Oh, uh, excuse me. Sorry about that. The moment took control of me there. Thanks for sharing this superb spire, Wayne! 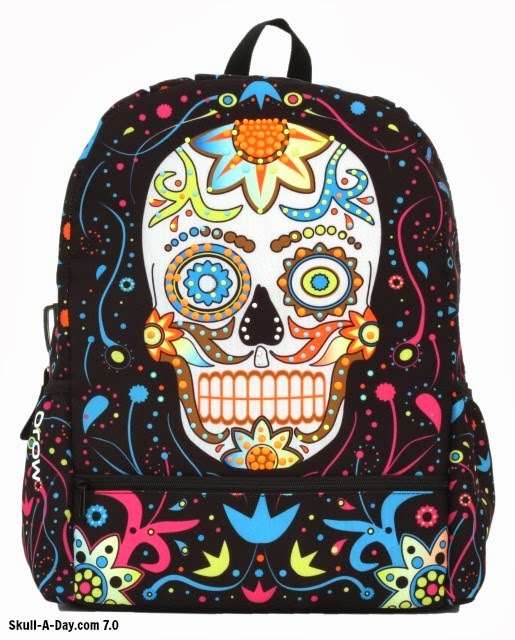 Mojo Backpacks was started in 2011 and was founded on the idea that a backpack should be so much more than just an accessory — it should be a means of expression much like a funky pair of denim or a crazy jacket punctuates a person's style. From their signature big face graphics and chunky zippers to their black light reactive bags, they add edge into our fashion forward creations to give their fans exactly what they are looking for. Some of the many backpacks they design, are skull themed. 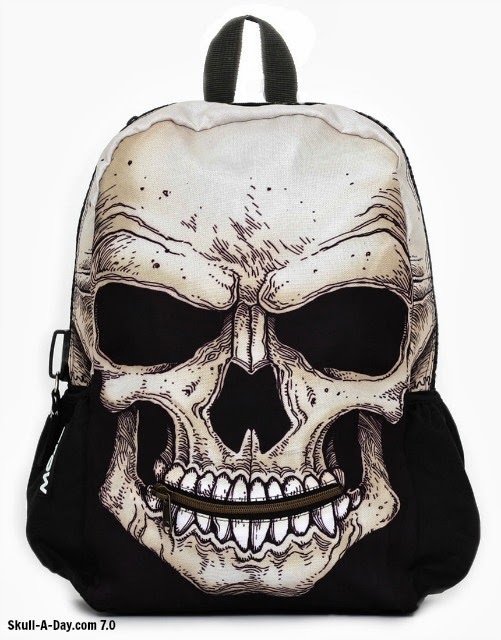 To share this love of graphic skulls, they are giving away two skull backpacks! Look below to see how to enter the contest! 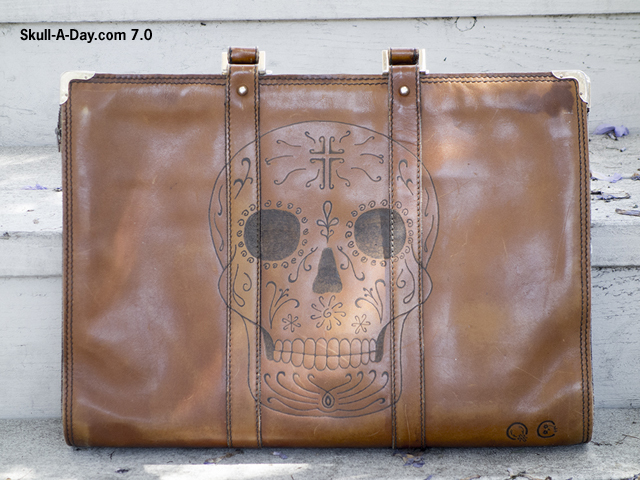 Day Of The Dead - The Day Of The Dead just got a lot more psychedelic with this bag. It has multicolored stud details, reinforced back and bottom panels and Mojo’s signature chunky zipper. Mr. Peterson - This Mr. Peterson bag adds a little twist to the classic Mojo backpack. With a chunky zipper and large main compartment this bad boy has a completely flat front panel with a zipper pocket mouth detail – perfect to keep your keys, cell phone, or subway card handy. HOW TO ENTER: Since backpacks are meant to carry many things and go many places, to enter this contest, comment below with an answer to this question. 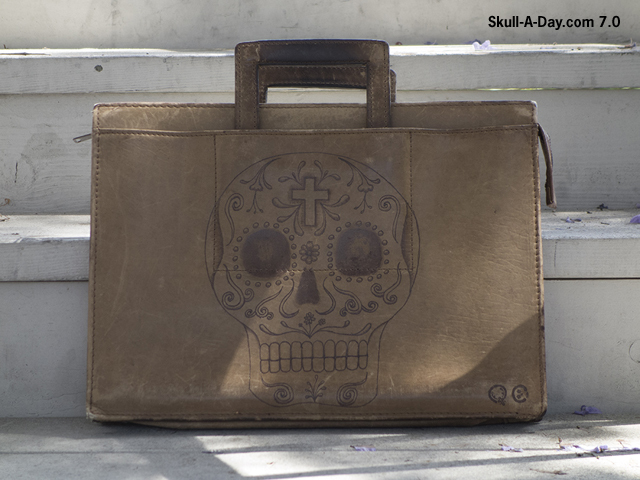 If you won one of these skull backpacks, where would you take it, and what would you pack in it? WHERE TO ENTER: All entries must be made on this blog post, on Skull-A-Day.com. You CANNOT enter this contest by commenting on Facebook, Twitter, Tumblr, or Google+. CONTEST CLOSES: 11:59:59 PM Eastern USA Time Friday, September 27, 2013. 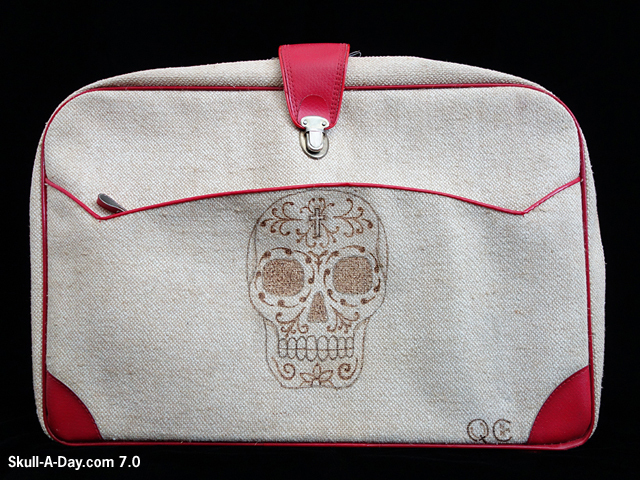 PRIZE SHIPS: This contest is open to all skull lovers in the USA only. Sorry everyone else. IF YOU DON'T WIN: Don't fret while the contest is running, Mojo Backpacks is offering a 30% off discount if you use the promo code "Mojoinsider", at checkout. You can see what else Mojo Backpacks is doing, on their Tumblr, Facebook, and Pinterest. Antonio Bopp has put together a great work of reusing nature's gifts for the sake of skull art. His letter describes his efforts best- "Over the last 10 years I have dedicated my life to understanding “The American Agricultural Landscape”. My journey began on a small farm in upstate N.Y. I was chosen to participate in the newly formed “Farm Apprentice Program” offered by the Catskill Mountain Foundation. Located in The Village of Hunter, New York. The C.M.F. operates two farms following the “Natural Agriculture Method” inspired by Masanobu Fukuoka an Agricultural Scientist, Author/Farmer. His teachings focused on understanding the subtle physical relationships and spiritual bonds that exist in soil health, farmer, the people who eat the food and the society in which they live. I trained under Farm Manager Kenji Ban in everything from seed saving, soil management, raised bed construction, harvest, C.S.A. program and local farmers markets. These skull masks are called "Harvest Masks" inspired by Native American Agricultural Methods. These creations can be placed on a wall or soaked in water for 48 hours and buried to grow food. Most of these seeds are saved from the years growing season." Completely righteous and peaceful. Love it! Thanks for sharing your harvest with us, Antonio! J.E. 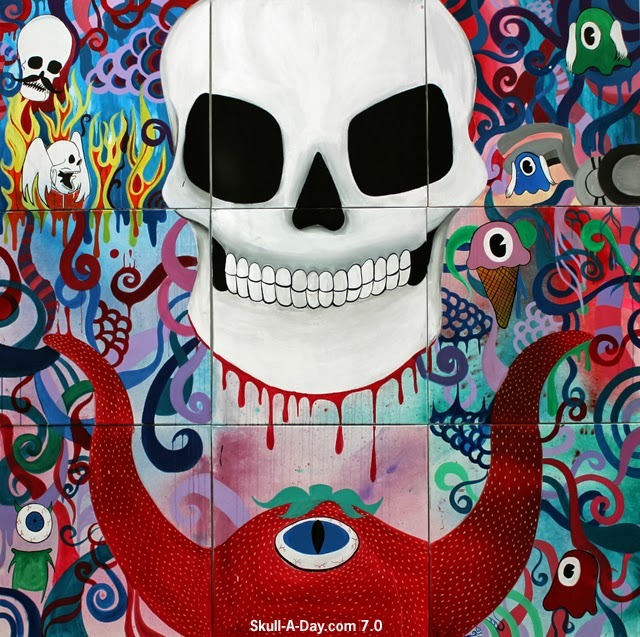 Heilbronner aka BlueStar Ravencougar, created this skull painting. It's interesting to see a skull with only the spine, and no additional anatomy. 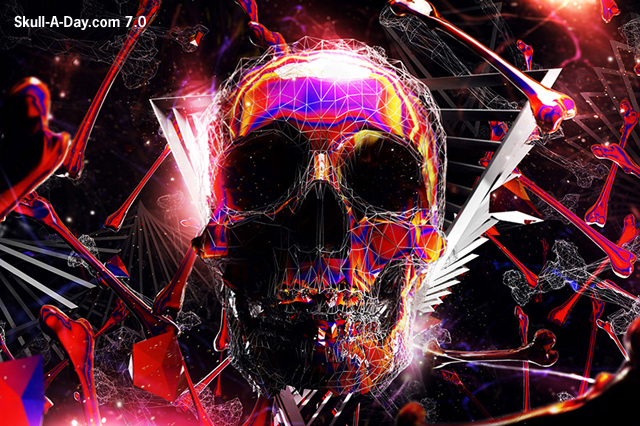 With the color flecks and abstract background, perhaps this is a futuristic skull and is drifting in some unknown dimension. Perhaps I just watch too much sci-fi. 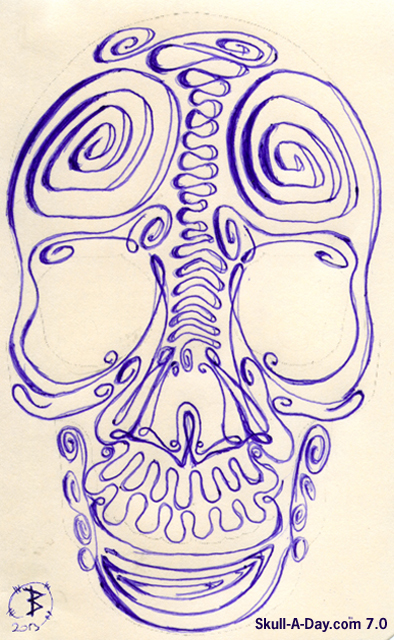 Kirill Borodulin didn't include much to say about this whimsical hand drawn skull he submitted. Maybe he was still dizzy from drawing all of the spirals. I'm not sure about that, but I'm sure appreciative that he shared it with us. Thanks, Kirill! 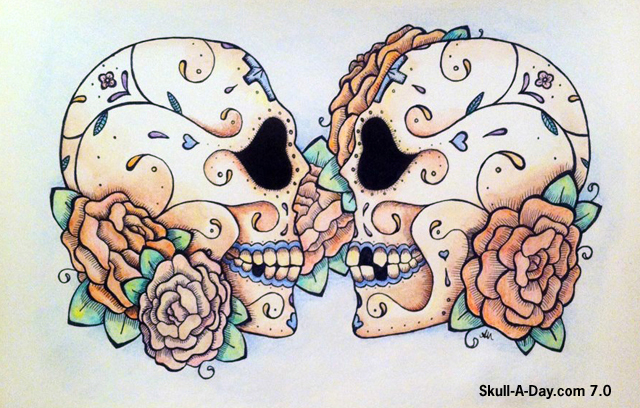 Alexis Moniello is an illustrator in NYC and wants to color your day with this couple of calaveras. Some sharpies and watercolor pencils were all she needed to brighten this spot on our site. 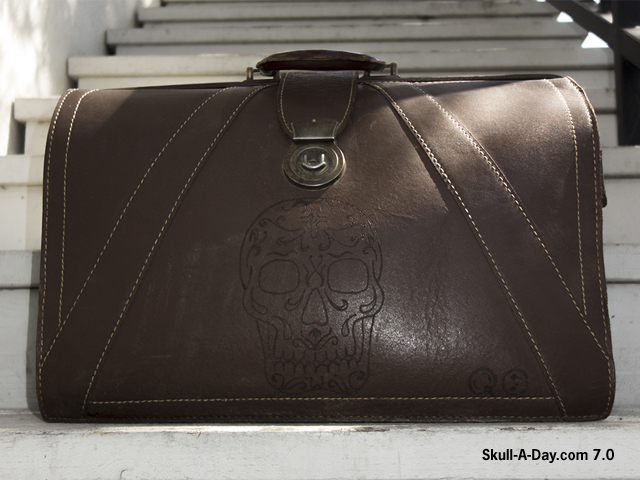 She says that she finds daily inspiration here on Skull-A-Day, and with that we thank her for returning the favor. Thank you, Alexis! Raschid Alonso, from Mexico City, is a freelance illustrator and an advertising designer. 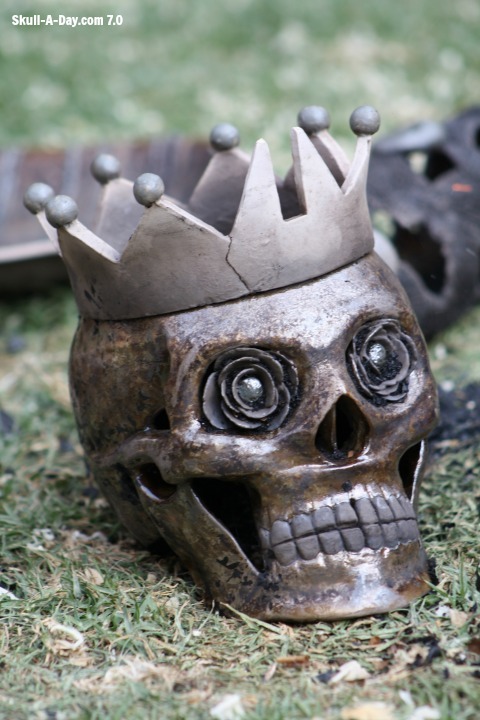 He creates many skulls, but this one is his favorite. 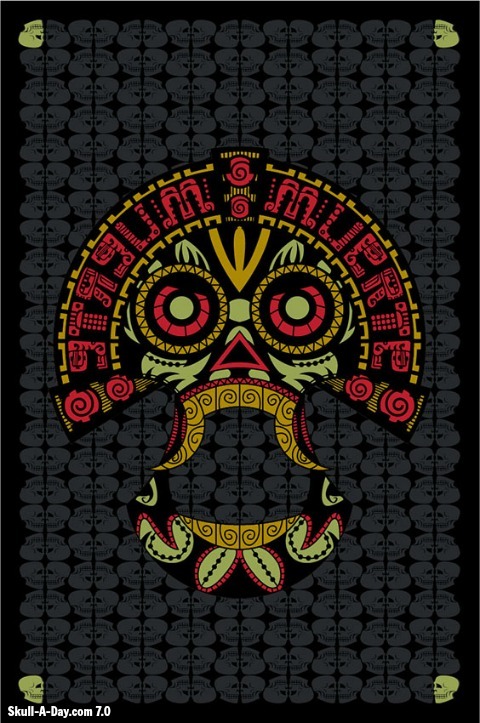 This piece speaks to the culture of Mexico, and it's ancestral history. 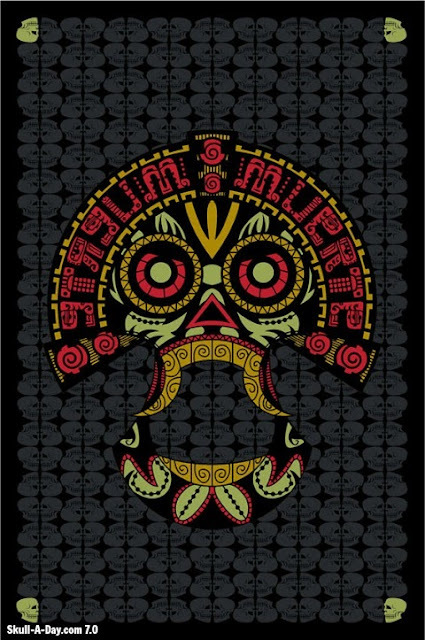 I'm fascinated by Aztec and Mayan artwork, since like many artists, their work had deeper meanings. The have a gruesome and colorful history. One that we might never fully understand, but can pay homage to through artwork and positive celebrations. Sisters Barbara and Judith Keresztesi in Budapest, Hungary are amidst a Creative 365 adventure of their own. For day 129 they decided to pay homage to our own Skull Master as a way to thank him for the inspiration. 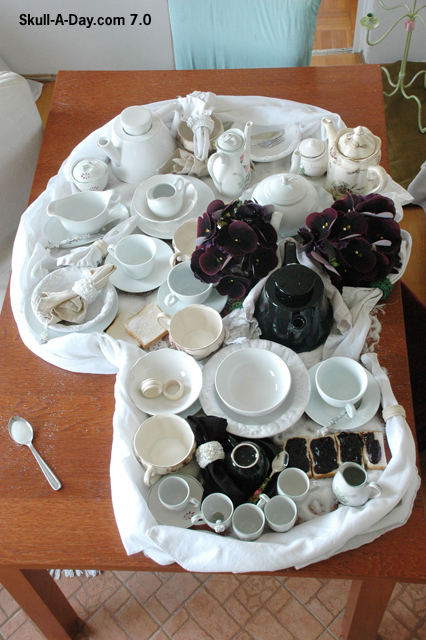 A lovely arrangement of dinnerware, table cloths, and some toast. You can read more about this piece here, or follow their 365 blog here. Thanks for sharing your excellent tribute, Barbara and Judith! "Skull Face" is a collaboration gif art that Director film maker Johnny Welch and Australian jewelry artist Sofia Fitzpatrick. Sofia has shared her skull jewelry with us in the past. If you look closely, you can see the skull rings on her fingers. 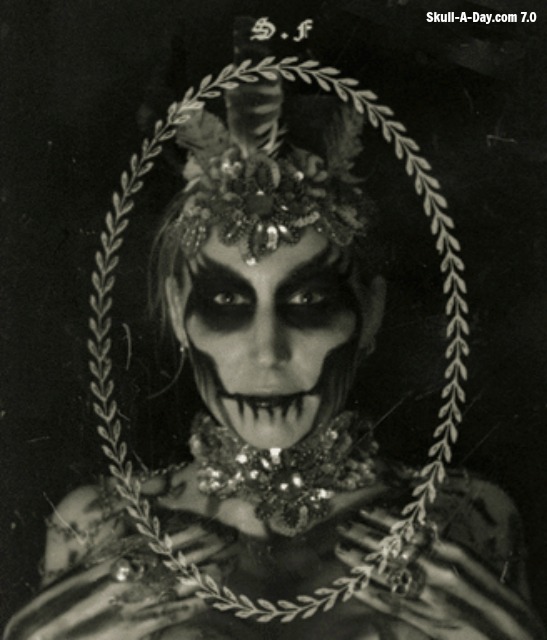 The photo of the finished makeup is great on it's own, but you must see the animation of the skull makeup being added to her face and a ribcage to her chest, at the bottom, to get the full effect! 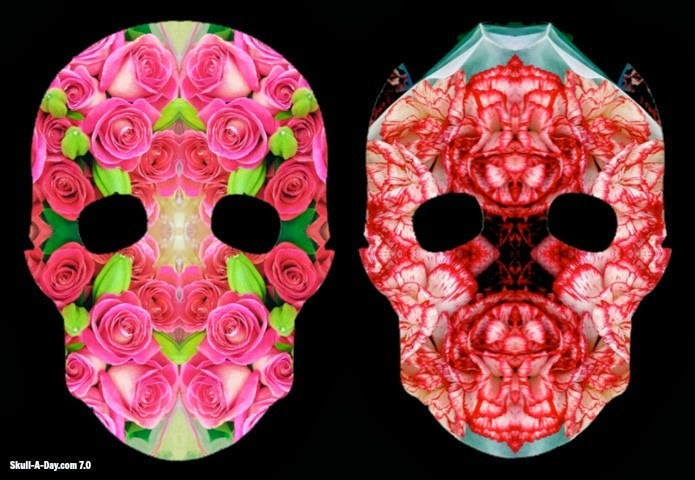 This uniquely styled ceramic skull is the work of Josh Boyd. This piece is titled "Pales In Comparison", but with it's 'creature from the black lagoon' looks and symbolic patterns I'd say it almost has no comparison. Crazy, creepy, and certainly cool. Thanks for sharing it, Josh! 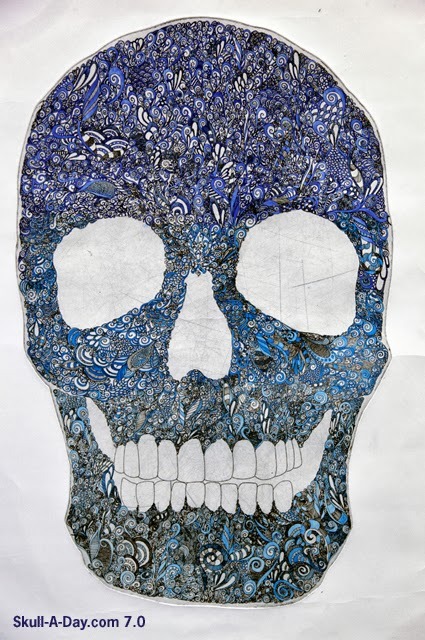 Gray, made this skull in a pottery class that he attend. He said, "Starting out I had no idea how it was going to turn out and I think its pretty cool." 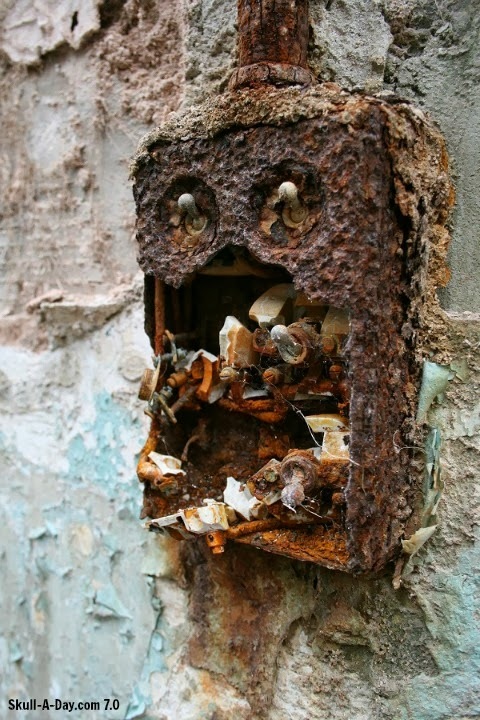 I was amazed to know it was made out of clay, vs metal. The finish on it looks like distressed metal. I like the contrast of the grey crown and details against the shine of the skull. This is a great piece, that shows great instruction and artistry. Today's skull was found by Robin Rowe on the rocks South side of Los Alamos, NM. 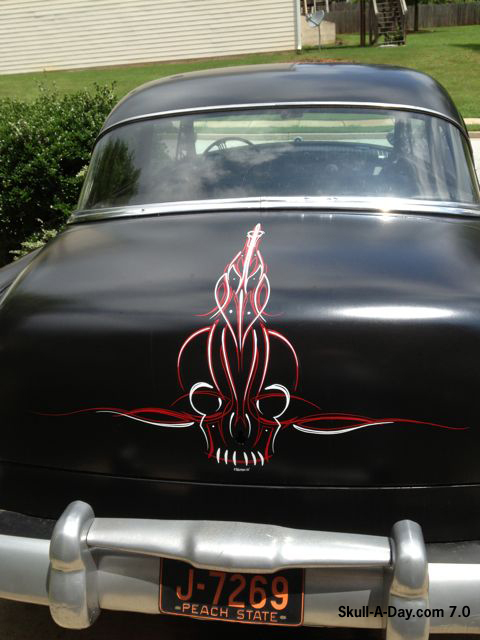 Clint J. Robinson displays his smooth handedness with this collection of pinstriped skulls(and others). 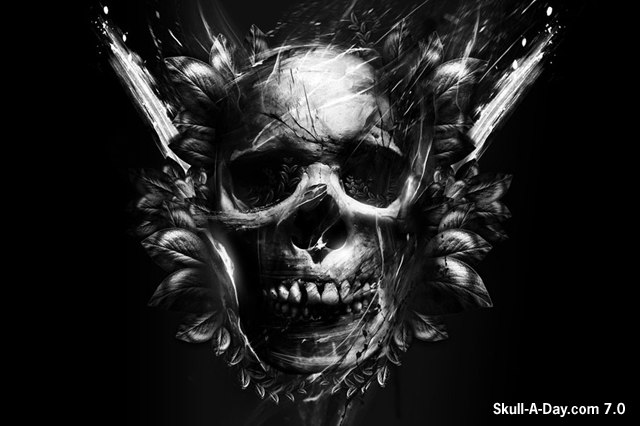 Intricate detailing is essential and Clint creates terrific skulls with beautifully crafted lines. He's pretty handy at all sorts of painting as you'll see on his site. 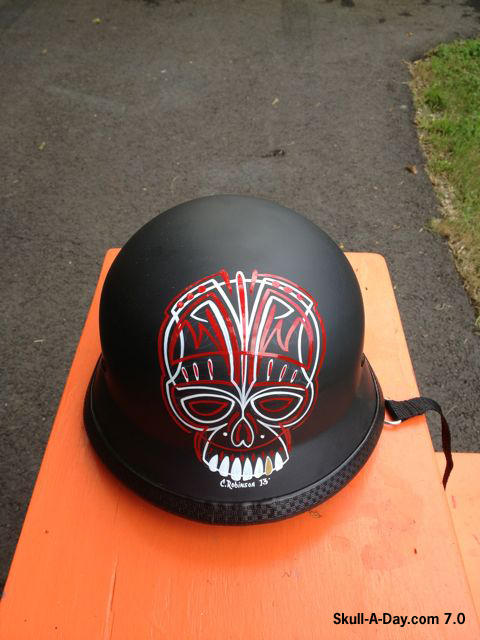 You can also click here to see more pinstriped skulls we've featured in the past, including a piece from our own Skull Master. 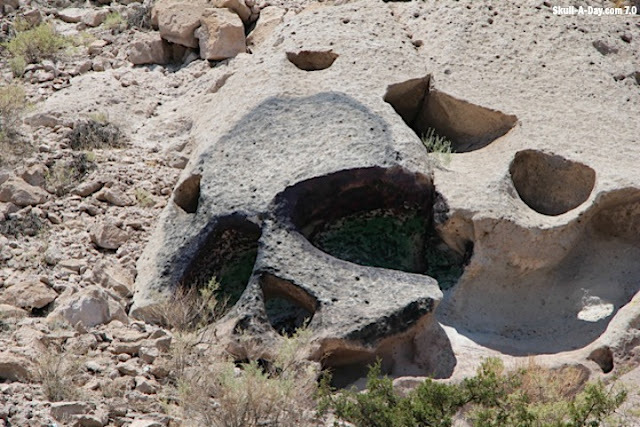 Thanks for sharing your wonderful work, Clint! 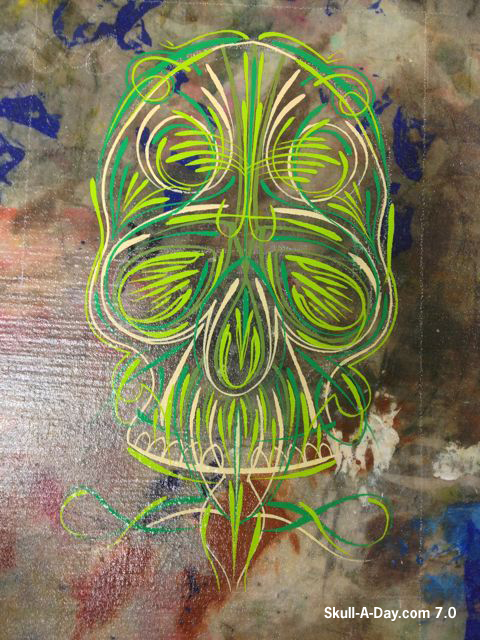 Thera Hillis, from Chandler, Arizona, painted this skull. 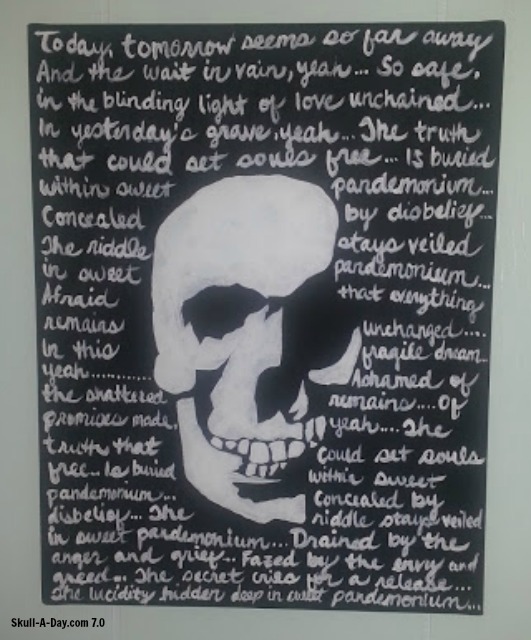 The words on the painting are from HIM's "Sweet Pandemonium". I've never familiarized myself with the band, until today. 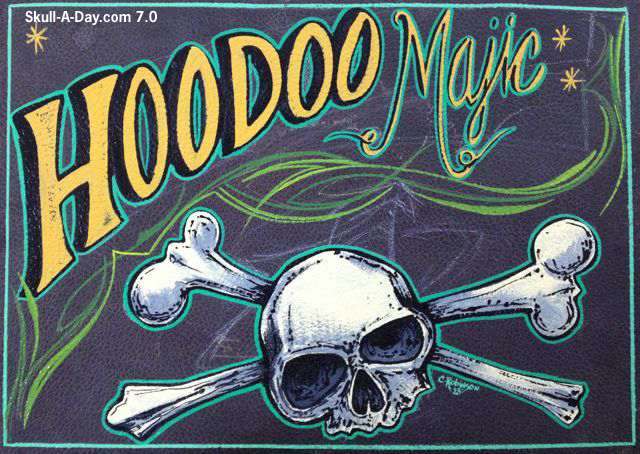 They have melodic and dark themes, which fit well paired with the skull. It's interesting to see how people connect to music, through their art and other aspects of their life. 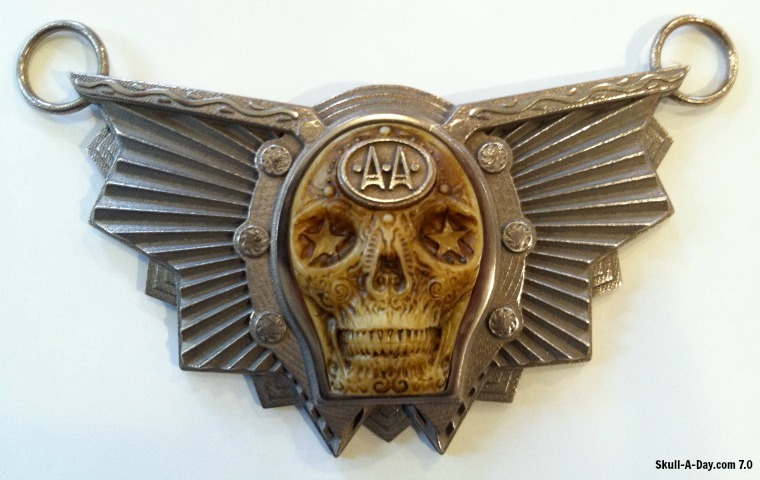 Kevin Mowrer created this medallion for an Aether Assassin, that is part of a book he's been developing. The medallion was 3D modeled and rapid prototyped. 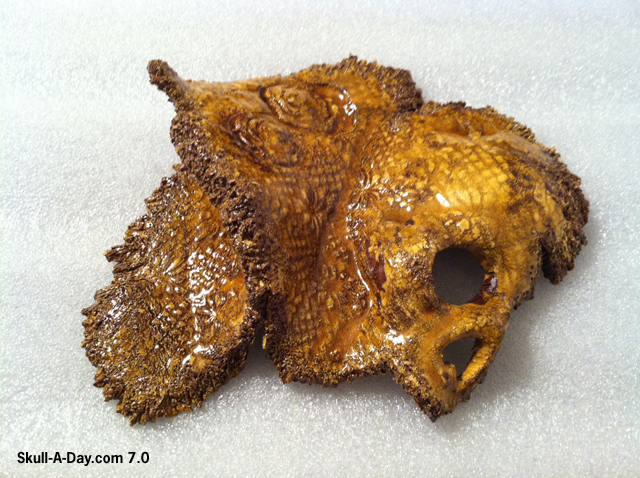 He used an oil stain on the plastic skull for an aged ivory look. This medallion is meant to be worn over a cravat. I love seeing the work that people put into costuming. Steampunk is one of my favorites that I pull from often to create costume pieces. 3D printing enables people to create amazing pieces by computer that they might not be able to create themselves by hand. You can see more of Kevin's work at Mowrer Art. Keat Leong is a full-time motion designer who grew up in the multi-cultural city of KL, Malaysia and is currently based in Taiwan. 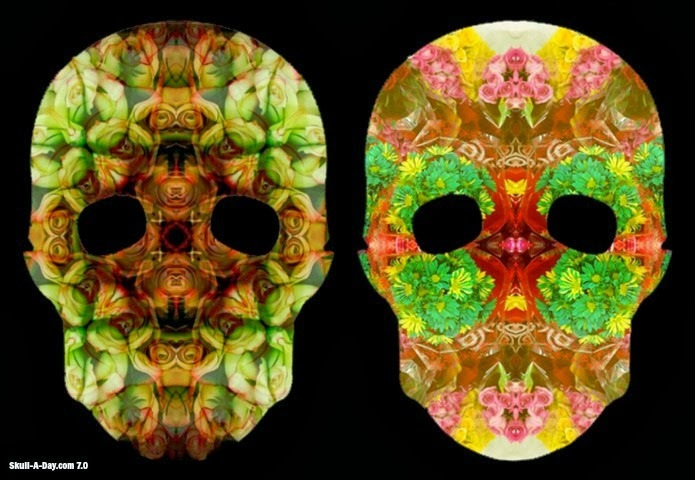 These two skulls we have for your viewing pleasure fall right in line with his own mantra, "My passion is to appreciate and create beautiful visuals both in motion and still medium. I dream to fill everyday with wonder and adventure and have those experiences reflect in my work". You can see more of his stunning portfolio here, but I'm gonna stare at the beauties for just a little longer. Thanks for sharing them, Keat! Bournemouth, England is where rediscovering artist, Thundalust, makes his home. After neglecting his art for too long he is reconnecting with his creative side and sharing most of the works on Instagram. This softly shaded skull demonstrates a great example of the depths you can reach when you apply yourself. Thanks for getting back to it and sharing the results with us, Thundalust! Vinicius Libardoni is a Brazilian architect and illustrator. 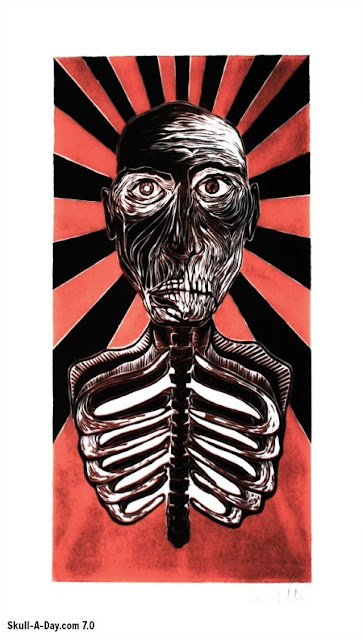 These are from his new woodblock printing series. 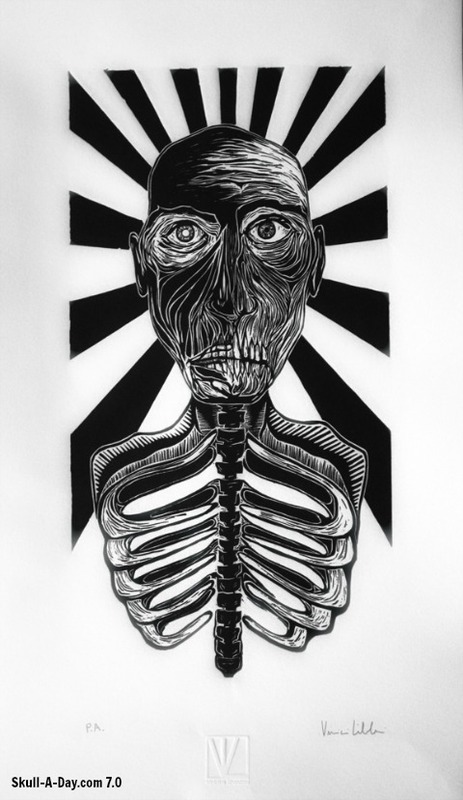 I love the inconsistencies of woodblock printing. 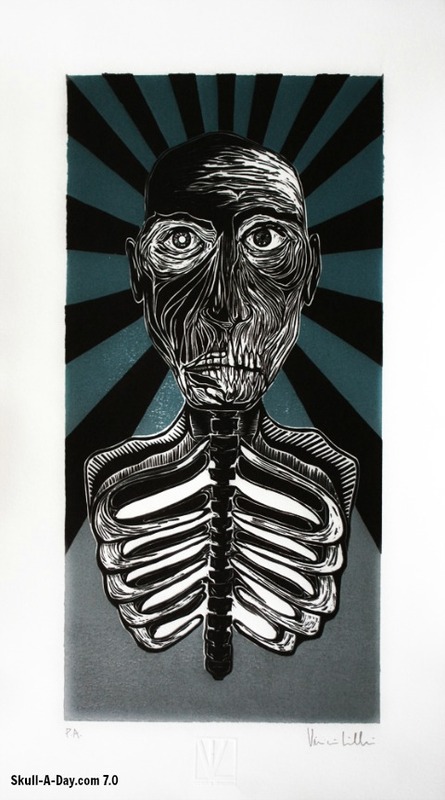 Each print can be slightly different based on the placement of the blocks when printing and how much ink is applied. These prints make me think of wooden coffins and decaying bodies. The face reminds me of death masks and heavily wrinkled skin. You can see more of his work on his website.